This is not actually a program. It's an Excel chart. An Excel chart that saved me a lot of time when I was moving from the Yamaha S80 to the Yamaha S90 ES. You basically feed it with a single voice SysEx dump (a.k.a. Bulk Dump) from a Yamaha S80, S30, CS6x or CS6R in hexadecimal format. Tools like MIDI-OX or Bome's SendSX for Windows automatically show their received SysEx dumps in hexadecimal format ready to copy. If you're working with Mac OS X and snoize's SysEx Librarian you might need another tool like Hex Fiend to show the complete string in Hex format. 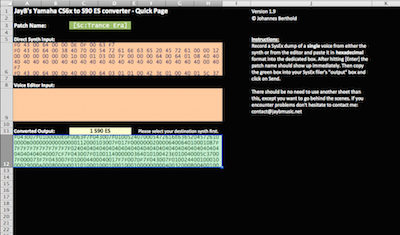 Once you've fed it you'll get another SysEx dump in hex format which you copy from the Excel chart either directly to MIDI-OX / Bome's SendSX on Windows or via Hex Fiend to SysEx Librarian on OS X. 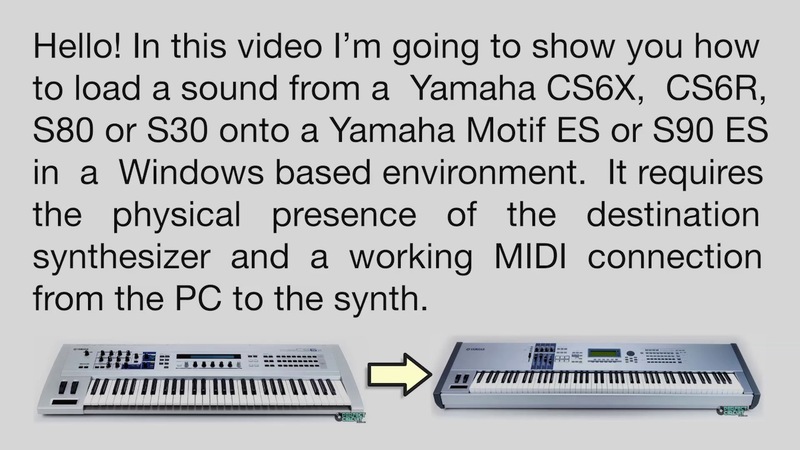 If you don't have a CS6X or S80 yourself you can use the editors of these synths and capture their MIDI Out using either a physical MIDI Loop or LoopBe1 to route it into the SysEx tools. A voice bulk dump is transmitted when you double-click a voice patch as if you want to edit it. It's not perfect and some may think that the process of conversion is too intricate, but I can assure you: reprogramming everything by hand takes much longer. Also, the result is about 98% to 100% like the original, and sometimes even sounds better. Click here to download a tutorial video. A really small but really useful Apple Logic environment layer for Quasimidi Sirius. 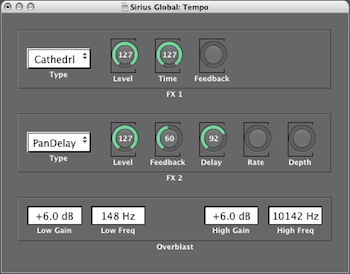 It lets you control the Sirius's FX settings and gives you all four EQ parameters of the Overblast knob. Having this in your songs and templates you don't need the HiFi Overblast SysEx command anymore. I recommend to use the Import Layer function in the environment view to add this layer to your songs and templates. 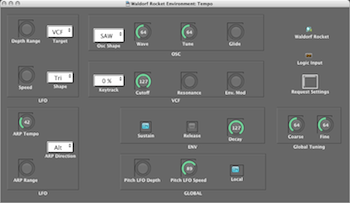 Since the Waldorf Rocket isn't a preset synth all I can offer for it is an environment layer for Apple Logic. It requires firmware 1.01 and offers pretty much all controllers the rocket reacts to via MIDI. It works bidirectional. That means, whenever you turn a knob on your Rocket, the environment will follow your movements, even if it's not opened. I recommend to use the Import Layer function in the Environment window. Afterwards you need to draw a cable from the physical inport your Rocket is connected to to the "OSC Shape" object and you need to set your Rocket's MIDI port in the "Waldorf Rocket" instrument object. That's all. ATTENTION: The filter mode and the boost switch cannot be controlled via MIDI! Matter of fact, sorry.